I Want To Read That: Review Ratings - Good or Bad? I've noticed a number bloggers are no longer rating their reviews anymore. What are peoples views on this? For me any rating with a 3 star or higher is good - it means I enjoyed the book and would buy more from that author. I think I have been lucky this year as I have only read one book I didn't particularly like but even then I would have given the book 3 stars as I thought it was really well written - I just hated the character with a passion! When reading other peoples reviews I find a star rating gives me a overall feeling for what they thought of the book - something I can't always tell from the review itself. I often find myself surprised by a low rating after reading what seems to be a great review or vice versa. So I don't know if this is good or bad. Does the star rating distract from the review itself? Do I rely on it too much? So the answer is: I don't know, but I'd love to hear what other people think! I like them when reading reviews that other people have written, but I find it very hard to do myself! I like the star thing - or at least at the end making a "my final thoughts" kinda thing - if I am searching say google reader for reviews on a book - lets pick Fallen for instance, and I want to find some reviews of it to decide if I want to read it - I dont want to read 100 reviews - I just want the basics of what they thought. KWIM? As such, I tend to look at the star rating, or the Final thoughts - to get a jist if I want to pick that book up next. Anyway, this only gives me three grades to choose from, and I wonder if it becomes a bit meaningless? Book Crazy Jenn - yep I do know what you mean and I think I do the same thing. I look at the star rating first and then read the review. Luisa - I agree - I don't think I would finish a 1 or 2 star book and if I hadn't finished it I wouldn't feel right reviewing it. As I used half stars I suppose I am effectively rating out of 10, or 5 if you discount any ratings under 3 stars. Hmm now I think I'm just over thinking it. Luisa - as an author which part of the review is more important to you - what is written in the review or the rating? I like the stars! It helps me gauge the overall vibe of a book. I guess Amazon got everyone used to the five stars. As an author, three stars says 'average' to me. And since so many people skim, they might see the three stars and not read the review, which could highlight some really good points. Guess it's all in perception. I tend to rate books like I do movies - on a scale of 1 to 10. You know, I think I often look at the star rating first too, and then read the review. The rating would never affect whether or not I read the review, though. It gives an overall impression, as others here have said. I'm still undecided, but this is very interesting! Hmm, and following on from what I said above, I think I've got to know the kinds of books that appeal to the bloggers I follow - including you, Sammee! I find your ratings meaningful, and I'm sure other regular readers do too. Twilight which I hate, and I sometimes just don't want to bother. In the review proper I try to put both the things I liked and the things I didn't as to give a feel of why I rated it that way. I rated my reviews for about 6 months, and found it the hardest part of writing my reviews. I decided to stop just because I didn't feel that I was giving an accurate overall review using stars - it was just too hard to pick a star sometimes. I'd often want to give a book 3 stars, but when looking at what else I'd given 3 stars to, I realised that there was a big difference in how much I liked them. I didn't think 2 stars was enough, and then I didn't know what to give it. I'm trying to come up with another way of rating books overall. I haven't thought of anything I'd like to use yet, but we'll see. I like reviews star ratings, and I like reviews without. At the end of the day, it's all down to how you personally feel, and how they effect your ability to write your reviews. 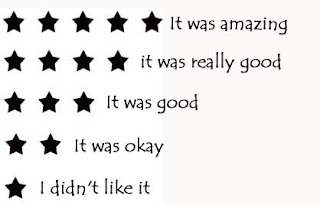 I definitely like stars (or some sort of object) for reviews. It helps me get an overall sense of the book from that blogger's viewpoint. I've been thinking about this a lot since Lauren's New Year Post. I have given reviews everything from 1star to 5 stars. I am very good at finishing books I don't like. I am very self-disciplined that way. If I couldn't finish I book, then I would post that on my blog. Maybe I'm meaner than everyone else but I'd rather my followers trusted my reviews. Having said that, now I'm getting to know authors I feel very nervous about hurting their feelings. When someone puts their heart and soul into writing, I don't want to hurt their feelings by giving the book 1 star if I don't like the book. I'm just one reader so I can only review from my perspective. But today, when I reviewed Keren's book I was so thankful to have my star rating because I knew beyond a shadow of a doubt that she deserved each and every one of them. I personally don't like systems where books earn points for various elements. I find it convuluted. If I do away with stars, I will create a Bookette Extraordinary Novel Award or something. So I can give it to authors liek Keren who write something that is outstanding. But I'm going to think long and hard about abadoning my stars. I really, really rely on star ratings when reading reviews. This is mainly because I rarely have time to read absolutely every review out there - but if I can see, at a glance, what you thought of a book I get a much better picture of whether or not I want it. I also sometimes stop a read a review because of the rating. If it is a book I had been longing for - and then discovered you had only given it 1 star, I will certainly read that review! But I completely agree with you about reviews that seem positive but then have low ratings. In those cases, I expect there to be a description of what they consider to be a 2 star book somewhere on their site (like the one you have)! Hey, me again! I just thought I'd contribute again and say that I'm going to try a grade rating instead of stars. Fingers crossed it works better for me! I definitely prefer a rating system, especially if I haven't read the book. It's a quick indicator of how the reviewer felt without giving too much of it away. I like reviews with ratings be it 5 star or out of a 100. It might be easier if there is a score for different aspects then averaged out for an overall rating- so if people enjoy plot driven or character driven books they can see what a book is to you, at a glance Hope that makes some sense. This post (and the comments) makes for really interesting reading. I think it all depends what type of review you're aiming for. I didn't think about this too much when I started reviewing, but having done it for a few months I realise that my aim is to find the book a 'home' with whoever might like it. It might be one that everyone will like, or maybe just a niche group of readers. A star rating doesn't really work with that. As you've decided to stick with the star rating, it must work for you, which is great. I kind of envy you for feeling confident in using a ratings system. Especially since it sounds like many people prefer them!